Andy to his friends, he's an eccentric game designer who's best known for creating a card game called Fluxx. His other card games include BttF, Chrononauts & EAC, Aquarius, Are You the Traitor?, Nanofictionary, Just Desserts, and most of the special versions of Fluxx (including Pirate, Zombie, Martian , Monty Python , Stoner, Drinking, and Family). Andy is the creator of the Icehouse game system, and is the designer of more than 20 games you can play with the pyramids, including Treehouse, TwinWin, IceTowers, World War 5, Zark City, Black ICE, Martian Chess, Martian Coasters, and Nothing Beats a Large. His other favorite ways to play with pyramids are Binary Homeworlds, Volcano, and Martian Hold'em. His other creations include a novel called The Empty City, a bar game called Cosmic Coasters, and the obscure videogame Icebreaker. Andy was born in Washington DC on November 5, 1963. As a youth, he became an Eagle Scout and went on to become a Vigil Honor member of the Order of the Arrow. He received a Bachelor of Science degree in Computer Science from the University of Maryland in 1986. Between 1983 and 1997, he played in, created, or otherwise helped out with 56 LARP games. Before starting Looney Labs with his wife Kristin, they both worked for NASA, where in 1993 some of Andy's software was launched into orbit (as part of the repairs to the Hubble Space Telescope). Now he gets to create cool stuff for a living as the Creative Director for Looney Labs. To date, he's been given 3 US Patents and 7 Origins Awards. His personality type is INTJ, and his Kolbe assessment index is 7464. Andy lives on the outskirts of Washington DC, near the Greenbelt subway station, in a pair of houses called Wunderland and Pepperland. Andy lives with two beautiful long-haired women (named Kristin and Alison), along with a dog (Molly), a snake (Benji), and three cats (Milkshake, Shiro, and Toto). Andy is a photographer, a writer of tiny stories, a cartoonist, and an outspoken marijuana-legalization advocate. His favorite color is purple, his favorite foods are steak and cake, and his favorite city is Amsterdam. He loves Tiki Culture, World's Fairs, and Roller Coasters. He's a hippie, a non-conformist, and an infrequent video-blogger. Although he's a raging introvert, he often Twitters and publishes random details about his life every whenever at Wunderland.com. He's a hermit who hates the telephone (but loves his iPhone) and who often ignores his email. He's a night person with odd sleeping habits, and his alter-ego is the Emperor of the Universe. He wears his watch on a chain around his neck and he habitually carries a Stardust in his pocket. Andy has a big collection of board games and a small collection of vintage arcade machines, including a Twilight Zone Pinball. He's been known to sell things on eBay. 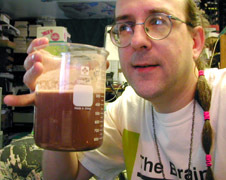 He loves to travel, he's still really glad to be alive, and yes, he likes to drink hot chocolate using laboratory glassware. Check out what people are saying about Fluxx right now! Note: Most of the stuff on these web pages was created by me and I'll be sad if you steal it. In other words, copyright © 1997-2010 By Andrew Looney. Looking for Part 3 of Mona Lisa Switcheroo?